Kebele’s special month of events, NovemberFest, celebrating 20 years of Kebele social centre, is up and running. In true anarchic style, it started a week ago and runs to the first week of December (see bottom image). But why wait, check out what’s on over the next 8 days! And if you’d like to put on an event over the next month then contact us asap kebelesocialcentre[at]riseup [dot]net – note that all events are at Kebele social centre unless stated otherwise. So Come On Down! Monday 2nd: 6:30-10pm – Vegan Dinner and Mellow Monday. Space to hang out, read books, play board games, drink tea & coffee. Plus Shiatsu tryouts. Special event approx 7.30pm – the Freaky Panda zine launch – with discussions on fracking, Basque & Spanish politics, and Food Sovereignty. 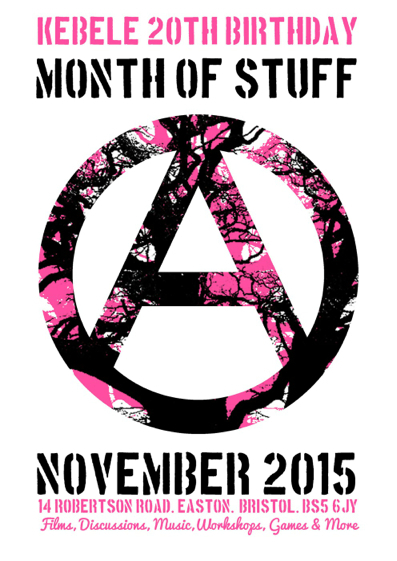 Tuesday 3rd: 7:30pm – Conscientious Objector and self-styled Class War Artist A.N. Onymous will be discussing their work. 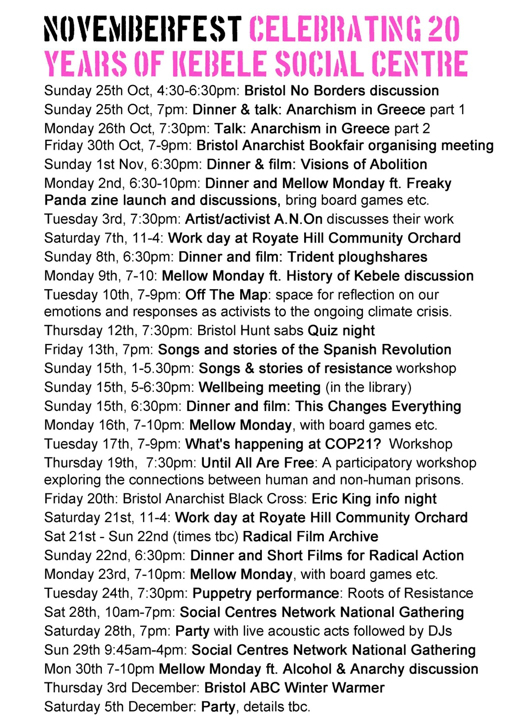 Come and see A.N.ON’s impressions of various protest camps, from OLSX to Borras Community Protection Camp, via Balcombe, Metrobus, Grow Heathrow and more at close range…and then form lifelong opinions about it. FB event. Saturday 7th: 11am to 4pm – bi-weekly volunteer workday at Royate Hill Community Orchard & allotment, Royate Hill, BS5. 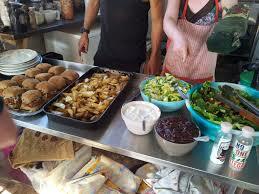 Wear old clothes & bring food to share for communal lunch around 1pm. Learn about permaculture in practice & growing food. No previous experience needed. Sunday 8th: 6.30-9.30pm – local Trident Ploughshares members are cooking the Sunday Social vegan meal, and showing a film. Monday 9th: 7-10pm – Mellow Monday. Space to hang out, read books, play board games, drink tea & coffee. Plus Bodywork (massage) tryouts. Special event at 7.30pm – The History of Kebele – evolution, analysis, stories and discussion + special guest – an original Kebele squatter tells all! Tuesdays – Arts Workshop from 7-9pm, learn various arts techniques. 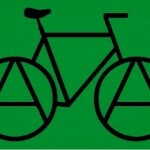 Wednesdays – Bike Workshop & Apothecary drop-ins from 12-4.30pm; Yoga 7-9pm. Kebele’s Library & Infoshop are available whenever the building is open. 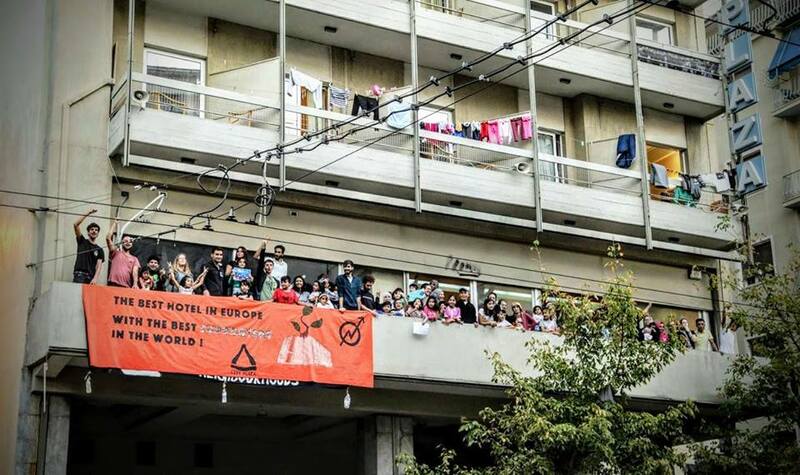 Note – all events/workshops/cafes at Kebele are either free or donation based, but nobody is turned away because they have no funds. 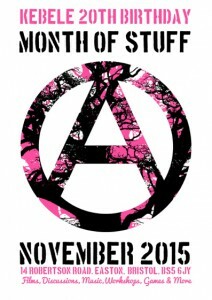 Previous PostUK Social Centre Gathering in Bristol this monthNext PostNovemberFest – weekend events!